Exaggerated facial expressions have been an integral part of performance across cultures for centuries. You need only look at the classical Japanese theater form of Kabuki. Many actors wear striking makeup (usually a white face with elements of red and black to highlight features of the face, particularly the mouth). The term "kabuki" apparently derives from the Japanese verb kabuku, which means “to lean” or “to be out of the ordinary.” As a side note, Kabuki theater started as a women-only theatrical form in 1603, but women were banned from performing in 1629 when it became a men’s only club. Very unfortunate. Ancient Greek theater used masks to indicate happiness or sorrow from the choruses. And the extravagant masks used in many African ritual dances throughout western and central Africa are a key part of communicating between the audience and the spirit world. These all serve as visual shorthands to help convey to the audience how to feel about the character or the present mood of the performance. Not surprising, then, that expressive faces are a key part of our visual vocabulary when we watch a movie. Interestingly enough, the exaggerated smile is often a counter-indicative visual clue. It doesn’t convey happiness or joy, but danger or evil. Just as Buster Keaton’s stone-faced look at disaster was a cue for us to laugh, a big, weird smile tells us to freak out. 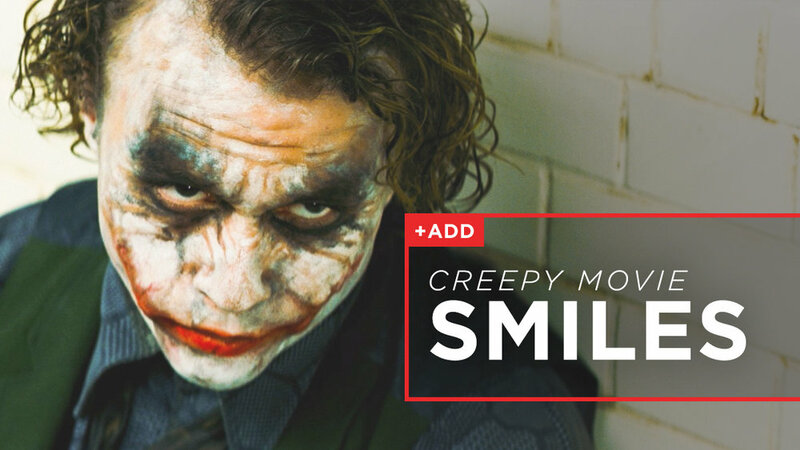 Here are some of our favorite creepy movie smiles. “Here’s Johnny!” shouts Jack Nicholson’s demented character in The Shining as he hacks his way into a locked bathroom with an axe. It’s one of the most famous images in film. While this face has lost some of its power due to a generation of comics doing bad Jack Nicholson imitations, at the time the movie came out, I remember being startled, frightened, and amused all at once. Perhaps the reason Nicholson’s smile is so disturbing is that it isn’t even a smile. It’s more of a lupine gesture of a predator on the hunt. The wolf bares its teeth. From the sublimely creepy to the ridiculously creepy, we turn now to Pet Sematary. Miko Hughes plays Gage, a murderous 3-year-old ghost who becomes a smiling slasher. That’s what happens when you’re reburied in the tainted ground of a pet cemetery, which happens to be built on ancient Micmac tribal burial grounds. The film, based on the Stephen King novel of the same name, opened to largely poor reviews but has grown in popularity over the years. At some point, people in the movies (think Poltergeist) are going to learn to leave ancient burial grounds undisturbed. Pet Sematary is your cautionary tale in these situations. Kids, next time one of your friends suggests you go digging up ancient burial grounds, just say no, okay? Sheesh. Ichi the Killer is one of the most disturbing films ever made. Banned in a number of countries, this movie features scenes of incredibly graphic and horrifying murders. Kakihara (Tadanobu Asano) is an enforcer for a Yakuza crime lord, pursuing the smiling killer, Ichi, in the seamy underworld of contemporary Japan. This film is not for the faint of heart, and definitely not one to even have in the house if you have children. Highly stylish, however. For my money, the best Batman movie ever is Christopher Nolan’s The Dark Knight, mainly because of the late Heath Ledger’s remarkable performance as The Joker. This is not the clownish Cesar Romero Joker of the old Batman TV series from the ‘60s. Ledger’s Joker comes from the much darker graphic novel portrayals of the character. In this film, the Joker wears a crude Kabuki-style makeup to disguise his “Glasgow smile.” Not familiar with that term? A Glasgow smile is a wound caused by cutting the corners of the victim’s mouth. Ledger’s Joker is unforgettable, Glasgow smile and all. The original creepy face in the movies has to be from Nosferatu: A Symphony of Horror (1922). This silent picture from Germany’s Expressionist director F. W. Murnau holds up tremendously well. To me, it’s the best vampire picture of them all. Max Schreck plays the spindly, demonic Count Orick, who sports some of the most grotesque movie makeup ever done. The entire production design presents a nightmarish vision of a small German city. If you’ve never seen it, you really must. Nosferatu is part of the canon of Movies-You-Should-Have-Seen-By-Now. By the way, after you watch this, check out the director’s 1927 film, Sunrise: A Song of Two Humans. Murnau emigrated to the U.S. after Nosferatu and ended up at Fox Studios in Hollywood. He made three pictures there, including Sunrise, a romance of the highest order. The American Film Institute included it in their 100 Best American Films list and the British Film Institute’s film critic’s poll has it ranked as the fifth best film of all time. So there!